On "Naphtaline", Electro-Pop experts Celluloide cover 13 New Wave classics. 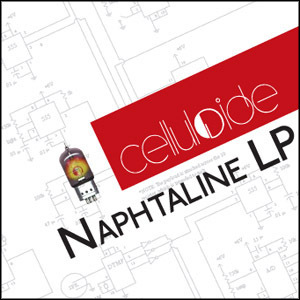 Previously only available online the Naphtaline EP release on CD follows the successful release of Celluloide's third album, "Passion & Excitement" released early in 2007. Naphtaline is used to protect clothes from Moths. And when Celluloide covers classic New Wave tracks, it is also to keep them fresh and lively. Previously available online only, the Naphtaline EP is released on CD. The original 6 tracks are remastered and 7 other covers (some released on compilations and some never released before) are added. Band covered in the album include 'obvious' names like Depeche Mode but also present unexpected versions of The Cure, Dead Can Dance, The Sisters Of Mercy or T21 songs. This compilation follows the successful release of Celluloide's third album, Passion & Excitements, published earlier this year. Find out how Celluloide spends its recreation time.